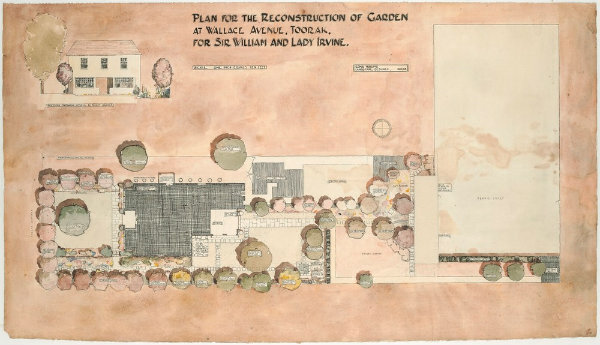 A previously unknown original watercolour plan of a garden by the landscape designer, Edna Walling, has been discovered by Manuscripts staff, amongst the Papers of Sir William Hill Irvine (MS 14267). Sir William (1858-1943) was a former Premier of Victoria (1902-1904), and Chief Justice of the Supreme Court. 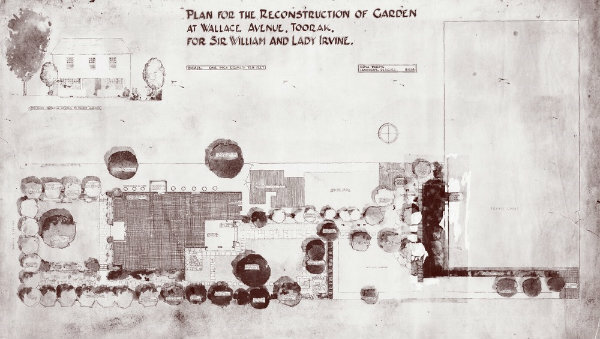 The plan is for the garden of the residence of Sir William and Lady Irvine, at 25 Wallace Avenue, Toorak, Victoria. It is a presentation drawing, showing the layout of the garden and tennis court, as well as a charming, but small elevation diagram on the upper left, showing the levels of the front garden. The plan details trees, drying area, chicken coop, flower gardens, pot plants, retaining walls, steps, paving, ornamental pool, sculpture, kitchen garden and potting shed. The garden’s existence was already known because the Library’s Pictures Collection held two copies of this plan, a negative dyeline (H40536/1), and a print (H40536/2). Edna Walling often created beautiful watercolour presentation drawings for her clients (she made working copies – often dyeines, which resemble blue prints – for herself and her workers). This particular garden plan was created in 1933, when she was not quite at her peak as a watercolourist (her technique from 1937 onwards displays true mastery of the medium), but she was certainly at her peak as a landscape architect. Just the previous year she created the garden Mawarra, in the Dandenongs, Victoria, which is regarded as her masterpiece. Walling is Australia’s best-known and most influential garden designer. The State Library holds about 4500 of her photographs and over 300 garden plans, as well as numerous manuscripts. More information can be found on our Edna Walling webpage. 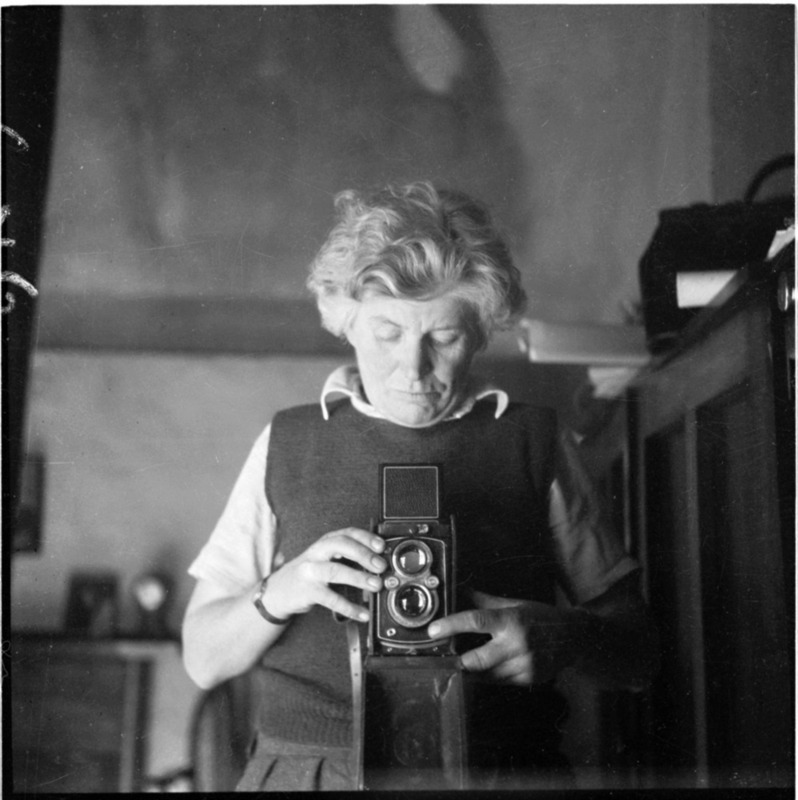 We are very interested in the history of Edna Walling and her works. My husband is a gardener @ Mt Macedon and has worked on part of an old garden that she designed in Woodend. That’s really interesting. Has the garden survived intact (from the 30s, I’m guessing) or is it being restored after changes were made over the years? We have a garden plan in the Collection of a Walling garden in Woodend. I wonder if your husband referred to it in his work?